* Renovates - gives a high gloss instant shine. * Reodorises - unique air conditioning properties absorb stale odours. * Ozone friendly - does not contain chlorofluorocarbons. For renovating car dashboards, vinyl and plastic trim, NEW TRIM will give an instant gloss finish enhancement. Can also be used on wood and metal surfaces. Hold can as upright as possible, approx. 20cm from surface. Spray lightly over the surface to achieve the required level of finish. Polishing the sprayed surface with a lint free cloth will ensure a uniform finish and remove any excess. N.B. 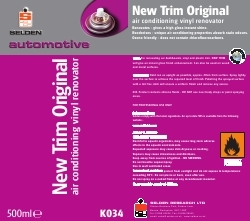 Product contains silicone fluids, - DO NOT use near body shops or paint spraying areas.